When I first wrote Life is a journey I was new in Blogging in my own Site after commenting in others for about a year. I had known for years ever since I first learned to count that August 3rd [a normal Saturday] was the day the Stork delivered me to Momma and Daddy. They told me that I would have a birthday every year on the same day and if I be good I would get a small gift every year on my birthday. In the meantime time past much too quick and since the turn of the century even quicker. By late last year I realized that it makes 75 years in total from 1940 to 2015 and I started wondering whether I would be safe getting up every morning. But I have always been one for adventure and decided to take my chances and the plan started during the night of August 2nd this year of 2015. I took my chance, the biggest one I have ever taken, and when the clock struck 6 AM I got up, still dressed in my nightgown turned the kettle on and made myself a steaming mug of coffee. Nothing went wrong; here I am today, still alive and unscathed. Nothing will ever make me hesitate again; let them come. I am ready for all of them. Blah all modern science, Einstein, Darwin and their Ilk; as a Naturalist I shall base my hopes in the Sun. It is not a good year to be that foolhardy but my Old Sun has been around the globe a good few years and I shall continue to believe that it will pull it off again no matter what Global Warmists, Freezers, Climate Changers and Al Gore has to say. I shouldn’t be too hard on the Climate Change Lobbyists because change is an ongoing process no matter how hard Mankind may try to screw it up. 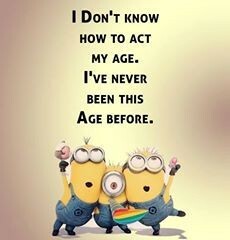 August 3rd, my birthday 75 years ago this year, normally heralds the arrival of spring where I live at Latitude/longitude: 32°28′46″S18°32′18″E, in the southern hemisphere you will note. For all you guys still sticking to Fahrenheit, a good bet to convert is C times 1.8 plus 32. That makes 10°C exactly 50°F and so on until you get 40°C giving you 104°F in Dallas TX in June. Right now our night temps should be averaging around 15 at night with 25 plus at midday. In stead we have had low single digits [down to 3° the night before last] and 11, 12, 13’s day time. This is the second year in a row, which makes you worry a little. Last year it took half of my almost full grown guava tree but it recovered a little during the summer; two weeks ago the black frost hit it again. All the leaves right around the entire tree had turned a sickly black. I called ole Rip down from the hills and we took a couple of branches off, thick sturdy ones 3 inches circumference; inside sat a small core of about half an inch. “Take the tree out and plant a new one before the heat of December,” ole Rip advised. “The sun is a little behind this year,” said the wise old scorcher. I checked up my personal diary that I keep up to date; yes, truly today we are 61 days following the Northern lift-off over America. That means at even speed our day should have stretched by 80 minutes since then. Instead we are at 65 minutes today. “Don’t fret,” old Rip said, “it gained a full 3 minutes yesterday and will pass the equator at full speed before it starts slowing down for the December maintenance crews to get it ready for the return start-up December 21st. I am reassured; it’s nature. Perhaps we had a few human germs too many down here this winter, to freeze out this year but we will soon be back to normal. “You bet,” said old Rip, “comes December you will have a dark tan while your palls are having their balls frozen off up North. “Trust the Sun, trust Nature, and trust in The Lord.” That was his departing shot. I shall follow his advice. I didn’t mention Darwin to ole Rip; it is not a good idea to do that when the old guy visits; he is still the old school original Naturalist, and so am I. An event or more than one event can in the course of time be viewed as history; it has happened that a link or parallels in a series of events can in time be seen as history in formation but one event that takes place today can in no way for sure be said to have made history on the day the event occurs. Many interpretations of history are sometimes used to support the cliché that “history repeats itself” but no one has yet provided any detail of which event of today will repeat itself and where. We live in a too fast and an ever faster changing world to predict the future on current events. Having said in History Part 2 that any interpretation of history depends on who wrote the book and/or who reads it as well as when it was written and when it is read one only has to look at the huge wars with words between races, cultures, religions on [just one example] the death penalty. It seems half of the World wants it abolished entirely and the other half wants to make it mandatory for serious offences. Presumably all participants in this war have access to the same sources of past history. Allow me some mischief, please. The death penalty is a very old matter; let us have a look at more recent times and use the Internet as an example. Man had by 1990 [a bare 25 years ago] established the basics for the Internet and we had email. Came the explosion of technology and within the same generation it started half of the World wants to curb the excesses of the new miracle but the other half is shouting for freedom of speech, the press and liberty for all. Who is right and who is wrong? The greatest anomaly of modern time is money. The rich have no money at all; what they possess is a link to the Internet; the poor are the only ones still using money because they can’t afford bank charges. In the meantime articles by the dozen are published daily on Tsunami floods of fraud, hot-money laundering and Forex trillions in mille-seconds going around but nothing for the poor. Where is the history of the Internet taking us? Where is the precedent to guide us? The predictions of the author of 1984 came and left without much ado; perhaps we will end up with his Animal Farm 2020. They are the only creatures that make sense with their innate ability to adapt one day at a time. Strong, sturdy, meek, graceful, whether small and tiny, great or large, patiently using only what they need. Yes, they will survive, to protect Mankind in his madness to destroy his own species. On August 6, 1945, the US dropped the atomic bomb on Hiroshima, killing about 140,000 by the end of the year, out of the 350,000 who lived in the city. Three days later, a second atomic bomb was dropped on Nagasaki. As the 70th anniversary of the world’s first nuclear attack approaches, Reuters photographer Issei Kato sourced archive images of the cities in the aftermath of the Hiroshima and Nagasaki bombings and revisited the same locations today. 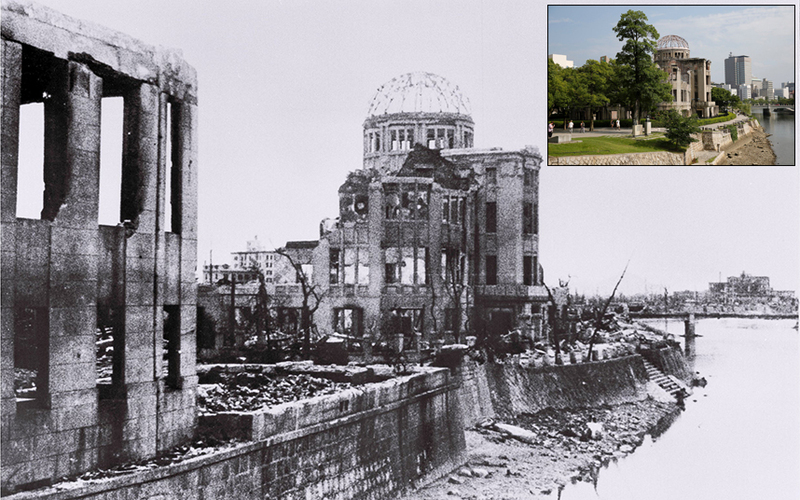 Above: The gutted Hiroshima Prefectural Industrial Promotion Hall, which is currently called the Atomic Bomb Dome or A-Bomb Dome, after the atomic bombing of Hiroshima on August 6, 1945, and the same location near Aioi Bridge now (inset). Don’t worry my friends and some of the family. I will be OK but at some stage soon before many more 1st of August’s life will cease. In fact, you can hardly call it life the way we used to define it. I shall survive because I am taking precautions to keep my brain alive; the farming community around my area of abode will plant and harvest; ants, flies, little worms and cockroaches will roam and do what they do to maintain the soil and keep it clean. The brain dead will ambulate for a while and drop away; more work for the ants, flies, worms and roaches to convert to material for the soil. I have seen this coming since 1990. The end of Life is nigh; hi-tech will hasten it and I expect the finale any day or week; maybe it will take a few months but surely then it will be done. It’s a freezing 3 F degrees out here this morning at 04:17 AM; an unusual cold climate change that came much too soon after the global cooling of last year. I suspect that to be a large part of the cause of the massive brain death rate syndrome that is spreading like a tsunami over the land. Our electric power is still on when it happens to be on; good men in the coal mines and oil industry are keeping it up [no place for women or pansies in that task; it needs men with brawn and brains]; our fixed landline phones are still on most of the time [again it’s men with strong arms and legs climbing up these strong four or five meters high posts to connect the copper wire. We have some problems with the major [well, we only have one] landline supplier that also wants part of the wireless cellular cake but fortunately for us keep on screwing it up so it is not getting anywhere. The high-tech wireless industry is on the verge of collapse. Let by a group we call Nebo Voda Non-Com. Just look at this and tell me whether I am completely nuts. My account is paid to date. They confirm it. I have just got my new data allocation for the month, a little over 4 hours ago; they confirm that. Why do I get this? To continue browsing the Internet, simply recharge with airtime. Save on data charges, and click here to buy a data bundle www.vodacom.mobi. You can also transfer a data bundle from any other Vodacom cellphone directly to your data SIM card, no hassle. STEP 1: Dial *111#, FREE from your Vodacom cellphone. STEP 2: Select Bundle Transfer and choose the bundle you want to send to your data SIM card. STEP 3: Start browsing again! Got a cellphone or a tablet? You can load your airtime by removing your data SIM card from your device and inserting it into a cellphone. Then recharge like you would with any cellphone. Dial *111# and select “bundle purchases”. Visit the Vodacom Online Shop at vodacom.co.za/shop and buy data with your bank card. Got a Vodacom 3G modem or router? Send a FREE SMS from your VMB Connection Manager with the data bundle size you want to 100. For assistance, please call Vodacom Customer Care on 082 111, FREE from your Vodacom cellphone. Farewell to Life my friends. It looks sure that by end of day the entire work force in high-tech will be down with BDS [dead brains]. As I said I have seen it coming since 1990. The invisible machine has taken over; the machine is running man. We may as well close schools and cease education; shucks that’s probably where the new generations fall victim to the BDS. Farewell to Life as we once knew it, my Friends. I am going to plant some cabbages, some tomatoes and early spring peas today. I tried their emergency number again and found one that can talk and decided on a different approach. First I insulted his Company then asked him how long he has been with them. “Three years,” he said. Then I asked him whether he knows that the entire Company is fucked up. You won’t believe it he laughed and said, “Yes Sir.” So what could I do? I thanked him for his honesty and he then admitted that there is a big problem right now; could not even guess when it will be solved but honest enough to tell me so. We parted in good spirits; at least one of them has a live brain. Update: 8/2/2015 3:26 AM. It was still off at just after one AM and I checked when I woke up a few miutes ago. It was on. PS: The blank spaces in the No-Com Voda Nebo-Com are from their site. I dunno how to remove blanks spaces.